If there is one thing that gets the GeoMarketers excited, it is natural disasters. Every year at this time we see hurricane trackers, 3D storm viewers and other “exciting” products to help protect us from the wrath of mother nature. 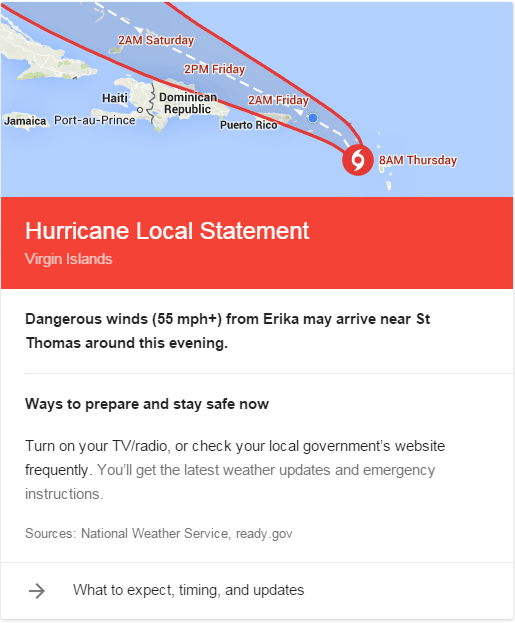 This year Google is promoting their Personalized Storm Tracker. The safety recommendations you receive will be tailored to reflect the current status of the event and your context. For example, if you search for a specific storm when it’s still several days away, you may see a map of the developing weather event and a recommendation to start preparing an emergency kit. If the storm is only hours away from your location, you might receive a reminder to start charging your phone in case power goes out. And if you search when the storm is nearby, you’ll get the most urgent information, like how to avoid injury from fast-moving water or flying debris. I feel like these things are more trouble than they are worth. Last Sunday I was at Sky Harbor Airport when a dust storm alert went off on all the iPhones in the baggage claim area. The whole place sounded loud as the alerts went off warning us that wind and dust were headed our way. The result of this great warning, people making jokes. Sure an alert was issued, sure it probably is a safety thing that we all get these alerts on our phones. But the delivery isn’t personalized, it’s a broadcast message and then 10 minutes of people joking about the alerts. At least in the USA, storms don’t sneak up on anyone. These products are great press but of little value.